old tshirt or 1 yard fabric. I am all about casual style, but usually like something to separate my tee from everyone elses. This started in middle school when I took my first sewing class and from their I was refashioning the family's "giveaway pile." Here is one I designed back then that I recreated for a tutorial. I wanted to share it because it's quite easy, yet still looks amazing! I've never seen anything like it...enjoy! 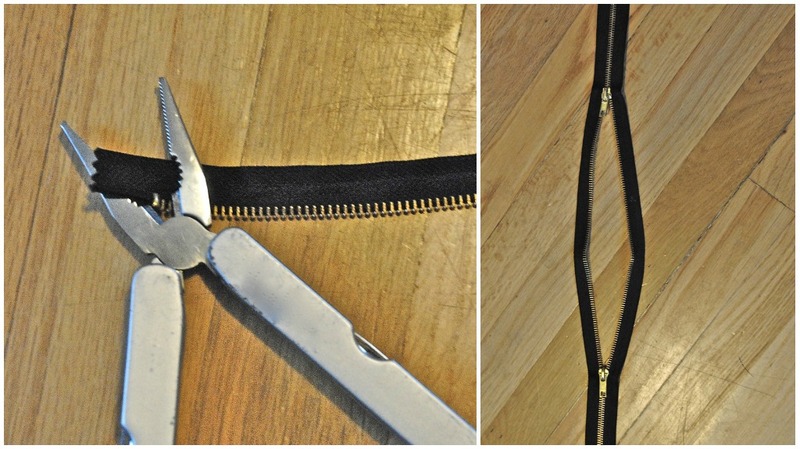 For this zipper: I know they have double zippers, but they go the other way so you will have to make it like i did. I had a 22 inch one (you can get these at any fabric store). I needed another side so I pried the little stoppers off the end and pulled another zip through...so now it's double sided. All I had was a black zipper, but they have some cool colors (neon pink, mint, corals, etc). 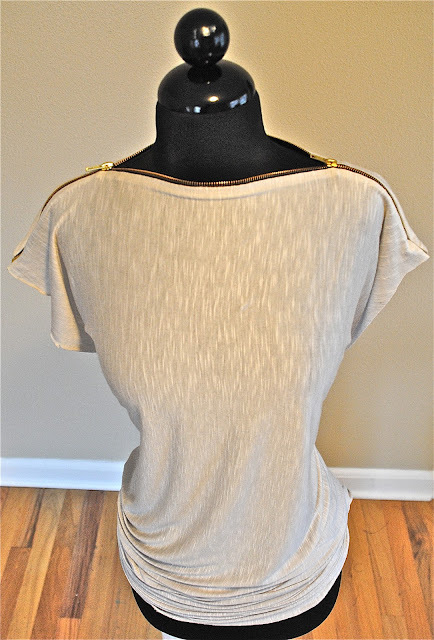 If you use fabric: I used a light jersey cotton with a nice drape. I cut 2 pieces of fabric at 22 inches wide (as wide as the zipper). If you want to finish the edges add a 1/4 inch seam allowance. It is 40 inches long to add a cinched waist. If the fabric is light, I would suggest ironing interfacing to the edges so it wont wave from the zipper. Sew (front and back) right sides together starting at either end. Sew the side seams if you used your own fabric. Then cinch the waist like I did here. This will give the shirt some shape. This is fantastic, I have tons of zippers stashed away, I think I may have to make something like this. omg how CUTE! i loveeee it. i want to try this. This is absolutely gorgeous! I'll have to try it! If I do, I'll probably post pictures on my blog - giving you credit of course! Love this!! How do you get that cinching at the bottom of the shirt? I love this tutorial and wanted to let you know that I featured it on my blog today. I love this shirt! I have a zipper I bought and I am going to give this a try. This is too genius. Love it so much! I'll have to try it. I made one and it turned out great! Thanks for the instructions! Girl, you should be on Project Runway. Wow! That is awesome! Great idea. Thank you for sharing them! I need to do some tutorials on my blog. J'aime bien cette idée et beaucoup d'autres ! La seule question c'est autour du cou ça doit gêner un peu, non ? Just made one of these! got the tutorial from here and i absolutely love it and got so many compliments. very unique thanks for the diy! Yes, you do the zipper on the shoulder seams neckline nd stop at the sleeve seam. Love the look! How were you able to keep the second zipper pull from from falling off the end? Great idea !! You inspired me ! Quelle bonne idée ! facile et jolie ! Many thanks ! My hack, based on your idea -- thank you! Do you mean you added another zipper peice from another zipper to make it with two zippers? And what you sewed over the end you cut? Fique por dentros das melhores restaurantes na sua cidade, veja mais em Guia Cidade. Wow, it is so cool.Haven't thought wearing a Tshirt with zipper. Even hamdemade ones. Love this diy idea.It is so awesome. Duage - As maiores marcas, os menores preços, entregue no conforto da sua casa.